A TV adaptation of a 1984 Broadway production, 1985’s Death of a Salesman provides a star-studded rendition of the 1949 Arthur Miller classic. A traveling salesman in his 60s, Willy Loman (Dustin Hoffman) returns home from a long business trip. Various issues impact Willy, especially some related to work. He falls on hard times and fears the loss of his long-time job. In addition, his sons Biff (John Malkovich) and Happy (Stephen Lang) show little respect for their father and they meander through their own lives without much purpose or impact. Willy’s doting wife Linda (Kate Reid) tries to hold the family together in the face of these challenges, but different matters come to a head and Willy demonstrates a weakened grasp on reality. Potentially embarrassing admission: I don’t think I ever read or saw Death prior to my screening of this Blu-ray. While I certainly maintained a cultural awareness of the piece, I don’t recall that I actually took it in via any of the potential media. I do remember that this 1985 production received a lot of fuss, largely due to Hoffman’s presence. When I referred to the show as “star-studded”, in truth that really mainly meant Hoffman. Malkovich became famous later and was essentially unknown in 1985, as was the case for Lang. In truth, the project’s second-biggest star circa 1985 would’ve been Charles Durning, as he was a well-known character actor at the time. Durning didn’t exactly sell tickets, though, so all of Death’s circa 1985 star power related to Hoffman. To my surprise, Hoffman becomes the weakest link in this Death - though maybe I shouldn’t feel too surprised, as the role showcases Hoffman’s weaknesses. While I often find Hoffman to provide entertaining performances, I think he tends to overplay his roles and leans toward a broad, hammy feel. Those trends come to the fore with Hoffman’s turn as Willy. While I get the impression the character should seem broken and beaten down, Hoffman leans toward bluster and anger. Some of this makes sense given Willy’s deep sense of self-delusion, but Hoffman doesn’t act the character’s age especially well – his Willy always feels like a younger man’s take on an older person. This becomes even more noticeable when contrasted with the other actors, all of whom tend toward a more naturalistic feel. While Hoffman emotes toward the cheap seats, the others keep things more subdued and realistic. Again, some of Hoffman’s bravado and blather do fit the character, as Willy remains the role least in touch with reality. Nonetheless, Hoffman’s Willy often seems like he exists in a different place than the others, so his loud, over the top performance fails to mesh. Because of this, Death works best when it focuses on supporting characters. Reid offers arguably the best work in the film, as she gives Linda a deep, aching humanity. Even when we don’t care for her choices – mainly due to her pathological refusal to see Willy’s flaws – we empathize with her, and Reid gives the role real depth and emotion. The same goes for Malkovich and Lang as the sons. Biff remains the meatier part, of course, as his conflict with Willy provides much of the story’s dramatic development. I’m not quite sure I ever buy Malkovich as the former football hero – the handsome, brawny Lang seems better suited for that role – but Malkovich gives Biff the appropriate sense of disillusionment. Lang also does nicely as the underused Happy. The younger son feels torn between Willy and Biff, as he shares some of Linda’s denial but also seems to recognize his father’s flaws, even while he tries to make nice and negate them. Lang offers good work in a part that could use dramatic expansion. Don’t expect director Volker Schlöndorff to add much visual panache to Death, as he gives us a product that feels like the “filmed play” it is. This occurs pretty literally, as Death never attempts objective forms of realism – for instance, the exteriors consciously opted to look like the painted backdrops they were. While I’d prefer that the movie’s producers open up matters and use some real locations, I do think Schlöndorff manages a little extra zing to the proceedings. Though Death remains fairly “stage-bound”, it still manages to feel moderately cinematic. It’s a subdued presentation but not an ineffective one. I just wish I more actively bought into the lead performance. There’s much to like about this version of Death, but I find myself moderately put off by Dustin Hoffman’s hammy work. Even so, I think the project does more right than wrong. 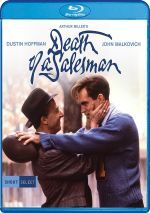 Death of a Salesman appears in an aspect ratio of approximately 1.33:1 on this Blu-ray Disc. Shot on film, the program had the potential to look great but the end result seemed lacking. The main problem stemmed from print flaws, as Death suffered from a surfeit of issues. From start to finish, the show displayed specks, marks and spots. These could’ve been worse but they still created frequent distractions. Colors also seemed lackluster. In particular, flesh tones varied – at times they looked natural, but they could also turn purple on occasion. Most of the time the hues seemed acceptable but these variations left them without consistent quality. Otherwise, Death looked pretty good. Sharpness was better than expected, as only minor softness ever materialized. This left the majority of the show with nice clarity and definition. I also noticed no shimmering, jaggies or edge haloes. Though parts of the image worked well, the source defects and color inconsistencies left it as a “C-“. I also found concerns when I examined the show’s DTS-HD MA monaural soundtrack. Of course, I didn’t expect a whole lot from a 31-year-old mono mix created for a TV show, but even so, the track seemed iffy. Speech became the weakest link, and that was a problem given how dialogue-heavy Death was. Actually, most of the lines sounded decent, and intelligibility usually appeared positive. However, I noticed occasional bouts of edginess, mainly during louder scenes – those forced me to downgrade my overall opinion of the mix. Music played a moderately small role in the proceedings – and effects did even less. Both seemed acceptable, though, as they showed fairly good clarity. I noticed a little hiss but other source issues failed to materialize. Overall, this was a lackluster mix harmed the most due to issues with dialogue. The Blu-ray includes one extra: a documentary entitled Private Conversations. During this one-hour, 21-minute, 19-second program, we hear from director Volker Schlöndorff, writer Arthur Miller and actors Dustin Hoffman and John Malkovich. Only a handful of these interview remarks occur, though, as the vast majority of “Private” takes us to the movie’s shoot. Some of that works well, as we get some good behind the scenes material, but other parts add little to our understanding of the production. Still, the good outweighs the bad in this often-intriguing glimpse of the filming. One of the more notable adaptations of a famous play, this version of Death of a Salesman comes with ups and downs. Surprisingly, it works best when it focuses on supporting characters and leaves its lead on the sidelines. 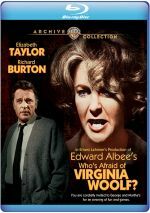 The Blu-ray presents erratic picture and audio along with a decent documentary. The 1985 Death doesn’t soar but it remains involving enough of the time.